Natsu "Leone de Cieli Vongola Version, Vongola box of the Sky"
Natsu, Tsuna's exclusive Vongola Box Weapon, was created by remodeling a Sky-attribute Sky Lion. It is imbued with the Vongola's latest technology. It is still in the process of growth and Tsuna has named it Natsu. Its figure is that of a small, immature lion that acts like its master in and out of battle, going from a serious and powerful animal to a timid and easily frightened cub. As they are both based on the same Box Animal, Natsu has some similarities to Xanxus's Bester. 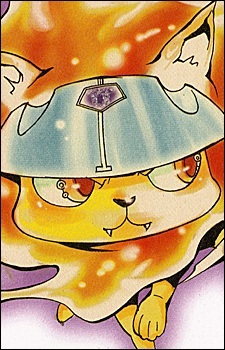 Just like the normal Leone di Cielo, it can assimilate the enemy with the battlefield through the Harmony of its Flames. Its greatest feature is transforming to the same weapons used by Vongola Primo (Sky's V.B.) and Tsuna now using (Sky's V.G. ), via Cambio Forma. The Fairy Tail Grand Magic Games is an epic showdown between the most powerful magical guilds in Fiore. Things are never as easy as participating in a simple competition. This is a dramatic journey of redemption that pits father against son, and places the fate of an entire kingdom on the line.